Curd, Galindo & Smith LLP Announces that their Client, a Los Angeles General Contractor, Jorge Corrales, Has Sued Los Angeles Lawyer Allen Lee Gilbert for Fraud, Misrepresentation and Other Causes of Action. "DARRNELL WATSON and his partner ALLEN LEE GILBERT began to use by trickery and fraud the names Jorge Corrales and Cortram General Construction, Inc and their state contractors license number"
Attorney Alex Galindo of Curd, Galindo & Smith, LLP represents Jorge Corrales and Cortram General Construction Services, Inc in a lawsuit against Allen Lee Gilbert, the Chief Operating Officer at the Law Offices of Glaser Weil LLP. Court records show that Jorge Corrales filed a lawsuit on June 19, 2018 in Los Angeles Superior Court Case No. : BC710775. The complaint alleges that Allen Lee Gilbert and Darrnell Watson fraudulently used the name of Jorge Corrales and Cortram General Construction, Inc to secure building permits to build various residential apartment buildings and custom homes in Los Angeles County. Allen Lee Gilbert is the Chief Operating Partner at the law offices of Glaser Weil. Mr. Gilbert is also a licensed California Real Estate Broker who has bought, sold, developed and built hundreds of properties in the Los Angeles area. The court file indicates that Jorge Corrales alleges that in an effort to save construction costs and fees, DARRNELL WATSON and his partner ALLEN LEE GILBERT began to fraudulently use the names Jorge Corrales and Cortram General Construction, Inc and their state contractors license number. The complaint states that DARRNELL WATSON and ALLEN LEE GILBERT used the name of Jorge Corrales and his contractor’s state contractor's license number without the express consent to secure building permits from the City of Los Angeles to construct residential structures. Jorge Corrales, in his complaint, alleges that as a result several buildings were built and completed totaling over $10,000,000 worth of improvements wherein he and his company were never paid for services on the permits. The complaint specifically identifies 14 properties. 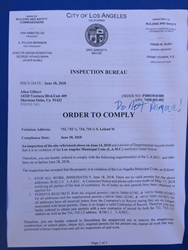 Some of the properties have been "red tagged" by the City of Los Angeles ordering that all work stop as the permits issued were issued without the consent of Jorge Corrales. The filed lawsuit goes on to state that Mr. Galindo's Clients discovered the fraud when a construction worker was severely injured on one of the job sites. Mr. Galindo is a founding member of Curd, Galindo & Smith, LLP which is a full service law firm that represents both corporate and professional clients and those who have been seriously injured or have lost a family member due to an accident, defective product, police misconduct or negligence. The law firm has recovered millions of dollars for its thousands of clients since 1995 by winning complex and challenging business disputes, death and injury cases involving police misconduct, traffic collisions, work place injuries and defective products, including defective automobiles, against some of the world's largest companies and governmental agencies. Mr. Galindo received his business degree from University of Southern California in 1982 and his law degree in 1985 from the University of Oklahoma. Mr. Galindo has been a lawyer and real estate broker for over 30 years. He has won numerous jury verdicts and settlements in the area of personal injury, products liability and civil rights/police misconduct cases. Mr. Galindo is a member of ABOTA which is an organization of attorneys representing both plaintiffs and defendants in civil cases. All of the attorneys who belong to ABOTA have earned great distinction at trial. Mr. Galindo is a member of Million Dollar Advocates Forum, Consumer Attorneys of California, Consumer Attorneys of Los Angeles, NPAP (National Police Accountability Project), National Lawyers Guild, National Association of Realtors and California Association of Realtors.